The Un-Official Blog of Romance Author Maddie James: What is Community, Anyway? I grew up in a small town. Eight hundred people is pretty darned small. I rode my bike all over town and walked to and from school, and walked downtown to get penny candy on a Saturday. I knew all my neighbors. The ones that were nice and the others that were a bit eccentric or mysterious. But we accepted them all because, well, we were all one, small community. I've been thinking about this "sense of community" for a few days now. A friend's blog spoke of Halloween and how she loved it because it spoke to her of community. People turn on their porch lights and small children have enough trust to walk up, smile and say, "Trick or Treat!" My friend J talked about how she loved that...and how she looked forward to that day, where people gave and smiled and said hello. I remember telling J then that I felt I didn't have that sense of community any longer. I live in a big city and I don't know my neighbors very well. I only know the names of the people who live on my right. I have no clue about the others. I travel all the time and am rarely at home. And for the three years I've lived in this house, I've not been home on Trick or Treat night to give out candy. I'm sure my neighbors think I'm a rather reclusive, eccentric being. I doubt, however, that I'm accepted because, well, there is no sense of community in my suburb neighborhood. Not like what I grew up with. In large part, it's because of me. I'm not home that much and when I am, I enjoy working in the house or in the yard. I do occasionally wave across the street or talk to the elderly couple next door. And I do walk the neighborhood from time to time. But it is nothing like the small community I grew up in. So perhaps it's part me, and part just living in the world today. I don't think we trust and put ourselves out in the world as easily as we did in decades past. So, as I continued to ponder this sense of community, it dawned on me. I may not have the traditional sense of community as in the past, but I DO have a community. It's all of you. My writer friends. My co-workers. My online networking friends. My SisterWriters. It's different but it's there. And how could I have dismissed that sense of community so easily? 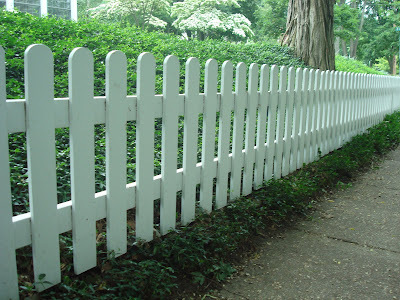 Because it doesn't have a picket fence around it? Perhaps. But it's there all the same and for that, I am very thankful. I'm thankful to be part of your community! I, too, am thankful to be part of your community. Good point, sometimes it's easy to think technology can isolate us, but in fact, there are so many communities of people talking and communicating that otherwise would not exist! Nice post, found you through the WOW blog. Hi Joanne. So glad you stopped by. I agree with you. I've met so many friends via Internet networking. It staggers to think how our world has changed so because of technology. I found out my neighbor died last week. I didn't even know! I guess my community tends to be on line, too. Oh Jennifer. I'm so sorry to hear that! It's so difficult to keep up with everyone, isn't it? Prayers for your neighbor.